This past September, Acura announced the sale of its 500,000th vehicle in Canada. By coincidence, this vehicle was sold in Toronto, the town I call home. 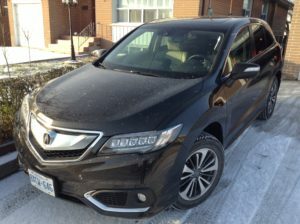 Another coincidence: the vehicle sold was the one I’m reviewing here, the 2017 Acura RDX. My Kona Coffee Metallic RDX Elite Package strikes a subtly handsome, competent pose, though it doesn’t really stand out from the crowd. Ground clearance of 137 mm suggests a modicum of off-road ability, though I didn’t test that during my time with the RDX. Distinctive “Jewel-Eye” LED headlights illuminate the road ahead. A tailgate spoiler adds a dash of style and improved aerodynamics. A quietly luxurious experience greets the driver and passengers. Drivers can use power adjustments for the front seat and side mirrors, then save those adjustments in one of the two memory settings. All passengers ought to enjoy adequate headroom and legroom if my 6’5” frame is anything to go by. Seats are heated front and back, ventilated in the front only. Given the outside temperatures when I had the RDX, I would have used heating on the leather-wrapped steering wheel if it had been there. 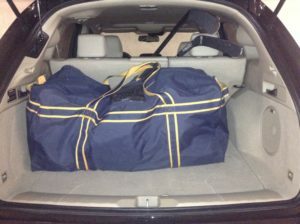 The power liftgate opens to reveal more than adequate amounts of room for a bag, and the sticks can go over the rear seats. Two screens sit on the centre stack. The top screen, shielded from the sun’s glare by a portion of the dash that juts out over it. is reserved for navigation. 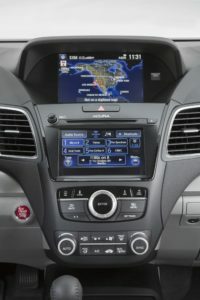 The lower screen offers access to infotainment features. There’s a lot of infotainment there. Here’s Acura’s full press description: Acura/ELS Surround® 410-watt Premium Audio System with 10 speakers, hard disk drive (HDD) media storage, in-dash CD, DVD-Audio player and Dolby® Pro Logic® II. The AcuraLink system competes with any other automaker’s in-car systems. It offers concierge service, maps, even the ability to determine a route outside the car using another computing device and sending it to the Acura so that the route appears when you press the Start Engine button. For all its digital sophistication, the system could use a tuning knob as well as a volume knob. Tuning the radio using screen-bred controls takes more attention than I’m comfortable diverting away from the road ahead. Also, the volume knob could be placed under the screen instead of over it. To change the volume, my girlfriend had to visibly lean forward from her perch in the front passenger seat to reach for the knob. Navigation is controlled by several buttons under the bottom screen. There’s a large dial in the middle of these buttons. Both my girlfriend and I mistook it for a volume or tuning knob, but it only works on the top navigation screen to do things like zooming in and out and entering destinations. Oddly, there is but one USB connection. Having another one or two for charging passenger’s devices would be useful, as would having at least one charing port accessible to back seat passengers. Power is never a problem for the RDX. A 3.5-litre i-VTEC V6 generates 279 horsepower that the driver allocates using a drive-by-wire system, then puts it on the ground through all four 18” wheels. Drivers can expect quiet highway rides and more than adequate on-ramp acceleration. Drivers will pay for the engine’s power and smoothness at the pump. I wish fuel economy was better than the 10+ litres per 100 km I achieved. Acura posts city/highway/combined numbers of 12.4 / 8.6 / 10.7. The 60-litre fuel tank demands premium fuel. Adaptive cruise control and lane-keeping technology allowed me to cruise on the highway without touching the steering wheel or pedals. I couldn’t allow myself to relax, though. No matter how often I experience these features, I still can’t bring myself to let my guard down when the vehicle is moving and I’m in the drivers seat. I tend to slow well in advance of red lights, a habit that serves me well on wintry roads. In my personal vehicle, that means downshifting using the manual transmission. I didn’t bother using the RDX’s paddle shifters, choosing instead to let the automatic take me through its six gears. But when I let off the accelerator while at speed, the RDX slowed noticeably of its own accord before I touched the brake. If nothing else, this behaviour fits my (mostly) conservative style of driving. About the shifters: I may have mentioned that the RDX could use features like a heated steering wheel and a physical tuning knob. Acura, if you’re looking for a place to save the money it would take to install these touches, please consider removing the paddle shifters. They can be fun the first time you use them. But in an otherwise automatic transmission-driven vehicle, I suspect few people will default to paddle shifters. (presuming drivers know what these paddles do in the first place). AcuraWatch™ safety and driver-assistive technologies comes standard. Several times, I braked a little late behind a vehicle slowing down to make a right turn. Each time, the screen in the instrument cluster changed from its real-time monochrome fuel economy reading to flash an insistently orange BRAKE NOW message. That’s about as much as I would let myself test the RDX’s collision avoidance abilities. Put the Acura in reverse and not only do you get a backup camera, but the side view mirrors tilt down to provide a better view of any obstacles beside the vehicle. Parking sensors alert drivers to anything they might not have noticed. Acura created a parking brake foot pedal near the door. I could feel the underside of the pedal on the top of my left foot when I placed my foot on the dead pedal. That dead pedal, a feature as common to cars as wheels. is meant to enhance driver comfort. Too bad the foot pedal gets in the way. The RDX starts at a base $42,190 MSRP. The top-of-the-line Elite Package I tested retails for $46,790 MSRP.